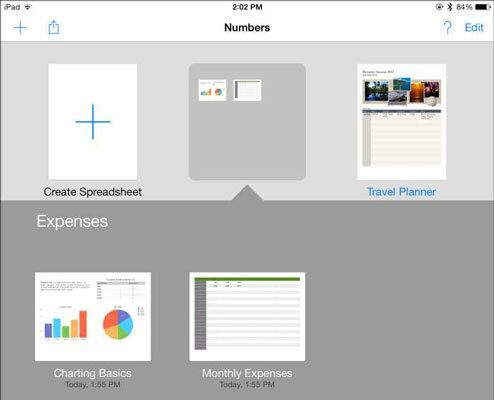 You’ve already seen the major iWork controls on the iPad. Here, you look more closely at popovers; the Format, Insert, Tools, Share, and Play buttons on the iWork toolbar; and Modal view. An important interface element in the Pages document shown in this figure is the popover. Common to all iWork apps, the popover resembles the dialog. It’s like a menu that appears when you tap a button such as Tools; it has been redesigned for iPad. Recognize the purpose of the popover. Each popover box includes an arrow that points to the object that opened it. Dismiss the popover. If you want to dismiss the popover (the equivalent of the Close or Cancel button on your Mac), tap anywhere outside the popover. Make a selection on the popover. When you tap a choice in a popover, it’s carried out and the popover closes automatically. Also visible in this figure is the toolbar, which runs along the top of the screen. On a Documents screen, the toolbar displays the name of the app in the center and the Help and Edit button at the right along with the plus sign (+) and Share button at the left. 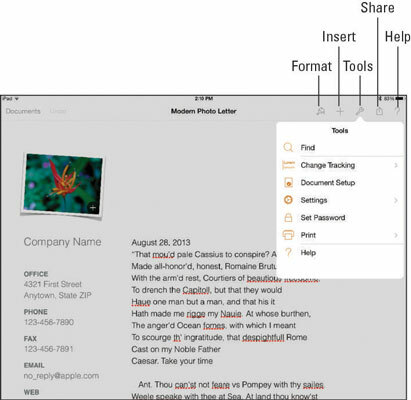 Tap Edit, and your document icons start to jiggle — just as the icons do on the Home screen of your iPad. 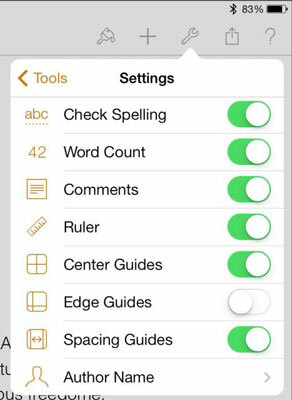 (And, just as on the Home screen, tap and hold a document icon and you enter Editing mode automatically.) While the icons are jiggling, you can drag one onto another to create a folder — just as on your iPhone and iPad Home screen. Tap a folder to open it. The folder expands, as shown in this figure. From there, you can tap any document to open it. You can rename your folders at any time. Tap the folder name, and the name field opens so that you can rename the folder. You can drag a document out of the folder and back to the Documents screen. When you remove the last document from a folder, the folder disappears. When you’re finished organizing your documents, tap Done. If you choose an action such as copying a document, the iWork app automatically ends the jiggle-editing without your having to tap Done. 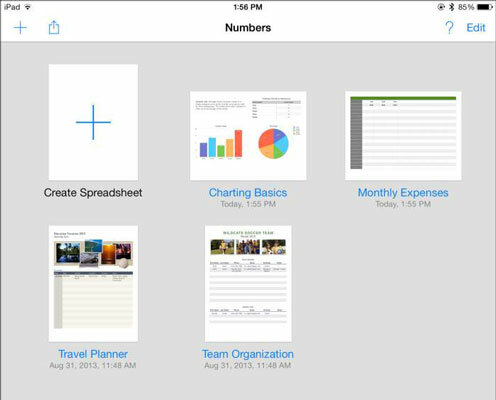 On the far-left side of the toolbar, the Documents button (titled Presentations in Keynote and Spreadsheets in Numbers) lets you see all your documents. Next to Documents is the Undo button. (It’s the same as the Edit___Undo command you may have on OS X for iWork and most other apps.) In the center of the window is the document’s name. Format: Provides information and formatting choices about the current selection in the document. From here, you may choose a style, a list format, or a layout (alignment, columns, and line spacing) for a selected paragraph or modify the style of an image. If nothing is selected, this button is dimmed. Insert: Lets you insert images from your photo albums on iPad. If you want to insert a photo into your iWork document, add it to your album by taking the photo or synchronizing it in iTunes. Tools: The wrench-shaped button opens a popover containing tools that are based on the document as a whole rather than on the current selection within the document. This figureshows the tools for a Pages document. Share: Use this popover to share a link to the document via iCloud, to send a copy via Mail or Message, or to open the document in another app (such as opening a PDF file in Adobe Reader). Play: In Keynote only, you tap this button to play the slideshow. Some menus have disclosure triangles that let you drill down one more level. 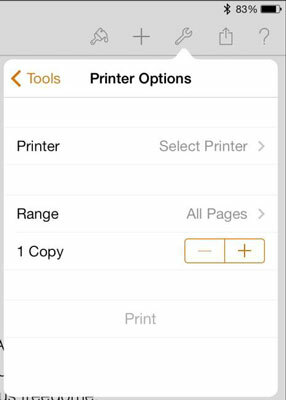 This figure shows the Printer Options. You can use the left-pointing arrow in the popover to return to the tools. The Settings submenu of the Tools menu is shown in this figure. Note that Word Count has been turned on; it appears at the bottom of the document. The ruler that you may have seen in Pages is used by its word-processing features. 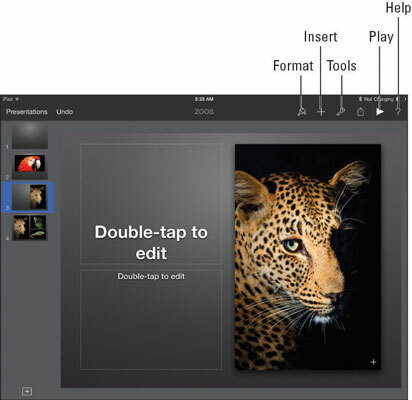 Similar tools at the top of the screen are used in Numbers and Keynote depending on what you’re trying to do. Another interface element that you encounter from time to time is known as a Modal view. Think of it as a dialog that appears on top of the screen (sometimes covering it all) with the document behind it appearing to be slightly dimmed. Often, a button in the upper-right corner lets you accept the information in the view. Sometimes, a Modal view presents you with a choice — buttons appear in both the upper-right and upper-left corners (they may be labeled Cancel, Edit, or Done in most cases). In these instances, tap the button that represents the action you want to take.